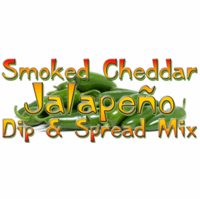 Smoked Cheddar Cheese Jalapeno Dip & Spread Mix by All Mixed Up, Ltd. Bold smoked cheddar dip loaded with spicy jalapeno peppers, green bell peppers, onions, and spices. Serve hot or cold. Gluten Free. No added MSG. Vegetarian.